If you are looking for top quality crown in O'Fallon and the surrounding communities of St. Louis, you can trust Soft Touch Dentistry. Our family and cosmetic dental practice includes an experienced, highly skilled dentist, Dr. Sarah Thompson, and a dedicated team of dental support staff. We offer crowns and many other restorative and cosmetic dental services in a warm, caring environment. From the moment you walk in our doors, you will find that Soft Touch Dentistry makes your comfort a priority. Our office features many relaxing amenities and we also offer options in sedation dentistry, including both oral and IV sedation. With her distinguished skill and talented artistry, Dr. Thompson carefully places cosmetic dental crowns to match your natural teeth. Our crowns are made out of top quality porcelain material, with no metal substructure, to ensure you get both the functional and aesthetic benefit you need. A crown is used to entirely cover a tooth that is damaged, restoring both the form and function of your natural tooth. If you have a tooth is severely decayed, broken down or has a large defective filling, a crown is often the treatment of choice. Dr. Thompson can also use a crown to strengthen a tooth after root canal therapy or to simply enhance the cosmetic look of your teeth. Our practice is committed to using the latest, most advanced technology available in restorative and cosmetic dentistry. We welcome the opportunity to restore and enhance your smile. To learn more about how a beautiful porcelain crown can benefit you, contact our office today. 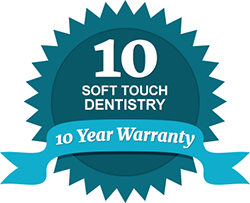 Soft Touch Dentistry is currently accepting new patients and we work with most dental insurance companies. For your added convenience, we also offer flexible payment options and financing plans. Let us help you achieve a healthy, beautiful and long lasting smile today!